Any follower of this blog knows I am a strong and passionate conservative. Typically that has meant I align with the Republican candidates for office. However, this year I didn’t feel there was a conservative in the race so I voted for 3rd party candidate Evan McMullin. My hope was maybe Utah would vote 3rd party and that would be a message from one state on both of the terrible options we were being given. Unfortunately that didn’t happen in Utah and they voted Republican as expected. Being a 3rd party voter this cycle has provided me an interesting vantage point that I didn’t entirely anticipate. I’ve explained in the past that a vote itself is statistically insignificant especially for president. That said, when I did vote for a major party I felt an investment in the outcome in a different way than this cycle. Voting 3rd party I’ve been able to simply observe and ponder the great country I am a citizen of and the tremendous events that have happened. It is this perspective that has made me a bit of a post-election coverage addict. I’ve watched an insane amount of pundits from both parties giving their conclusions of how this happened. To be clear, I was completely stunned by the results on Tuesday. I was positive Hillary Clinton was going to win the election, and we would just have to put up with more of the same type of failed policies we’ve had from the last 8 years. That was it and I could deal with that. But then Donald Trump won state after state, and I couldn’t believe it. In our world of PC and quick to offend lifestyles it seemed impossible that someone like Donald Trump could become president, and yet there it was. I honestly support more of the platforms and policies of the Republican party that Trump adopted so in a way I was glad but I was also sad to see the highest position in the land come down to someone like him. I certainly hope he proves me wrong and ends up being a better president than campaigner, but I was still sad. But self-interest is what we’ve got and so where is the cause for hope? I actually think there is a fair amount to be hopeful about. It might sound strange but oddly there is some hope to be had in self interest. Yes, Donald Trump has said some awful things and I understand why people are upset. I really do. However, it is not in his self-interest to implement all those things or continue saying all those things. I’m not excusing it in the least just stating what I think is reality. Even with a house and senate he still has to sell his ideas to the Congress and the American people. It’s in his self-interest to make them as palatable as possible. She could have gotten up there and been bitter and gone on a tirade, and I have no doubt a side of her wanted to do just that. I mean just days before she had called Trump supporters a ‘basket of deplorables’. Why didn’t she do it? Because it would not be in her self-interest to do so. Her best move at this moment is to do exactly what she did, and I commend her for it. I’m not trying to take anything away from her. I’m just being realistic about the motives of our leaders. I think this is perhaps why the Founding Fathers made Supreme Court justices lifetime appointments. It removes, for the most part, this element of self-interest and forces them to look at the cases without fear of backlash or legacy. Their jobs are safe and so they are free to decide on these important issues in the way they see fit. What he is basically saying is that it is in all of our self-interest to make this work and to want President Trump to succeed because if he fails we all suffer. It’s as simple as that. I’m not excusing any of President Elect Trump’s behavior. I’m merely saying- this is the situation we have and just like President Obama we have to make the best of it. It’s in our self-interest to do so. Peaceful protest is fine. I did it with the tea party and I’m proud of it but we must never allow it to harm the very institution we are trying to save. People breaking windows and destroying property are hurting the country they feel so passionate about. That is not the answer. We also need to take stock of the toxic climate we have created where good men and women don’t want to be involved in politics any more. Think about your friends and family. I bet most of them avoid politics like the plague- even discussing it, let alone running for office. Perhaps we have left no one more to vie for leadership than what we got in 2016? Either way, this is what we have left with. Agree with it or not, Donald Trump is our president. I want him to be successful because I want America to be successful. It’s as simple as that. Also you guys should read this post I wrote in 2012 about America and a female president. Lastly I want to say thank you to Evan McMullin for giving me someone to vote for. You stepped up when nobody else would and that means the world to me. Thank you so much! Hey guys! Just a quick update tonight. Today is the big election day and we can all breathe a sigh of relief when it is all over. I voted weeks ago for independent candidate Evan McMullin. I have lost faith in all politicians but he’s the best person running in this election by a long mile, so he got my vote. What you decide to do with your vote is awesome but I encourage you to get out and vote if at all possible. I know a vote is small in a sea of millions of votes but it’s still something and it is a great example to all around you especially your children. Let them know you care about what happens in this country and will do what small thing you can to make a difference. I know many of us feel discouraged. I feel discouraged. This election has changed me in ways I don’t know if I will ever get over. I know this blog says I am smiling but when it comes to politics I fear I will forever be a cynical girl. I’ve just seen too many people compromise where they promised they never would. To use the annoying phrase- it is what it is. We know we are living in the latter days. The signs of the times are all around us and we have the leadership to prove it. Maybe Utah will make a statement with its vote but I won’t be surprised if it doesn’t happen. Regardless, there are good people out there still holding out hope for their children and families. We cannot lose hope even if we acknowledge the human weakness all around us. There is still always great hope as long as Christ is listening and loving all who turn to Him. On a lighter note I am doing nanowrimo this year. I must say my heart isn’t really in it but my sister said she was doing it so I decided ‘what the heck. Why not give it a shot’. We are currently on day 8 and I am doing kind of a take on Mansfield Park by Jane Austen. My current wordcount is 17352 which I think is pretty darn good. I have been so busy so it is amazing I have pulled even half that off. Even if I’m not in love with my book it is still valuable to write every day and I will be glad when I can finish the goal of 50,000 words. I always learn something about myself through thinking about these characters in my nano book. Are any of you participating in nanowrimo? What are you writing about and how is it going? This week for Friday 5 the topic is best protest songs. This was a challenging topic but I think I came up with 5 eclectic choices that cover different kinds of protests. This was obviously a topic to recognize this horrible election which is almost over. Thank goodness! Fortunate Son- Creedence Clearwater Revival about the Vietnam War. What do you think of my selections and what are some of your favorite protests songs? As you can tell from my last post I’ve been struggling with some things happening of late particularly with the election. It’s just been a more than a little depressing. Fortunately, a funny thing happened on Thursday that brightened my day and I thought I would share it with you. I’ve mentioned in the last couple of posts I have already cast my ballot for independent candidate Even McMullin. He is the only candidate I can remotely have even a particle of faith in and no I don’t care about throwing away my vote. (I can’t believe smart people like Orrin Hatch buy into such nonsense). It’s a good thing he let me know because I’ve been a member of the LDS Church for my entire life and never heard of this “mormon mafia”. Well, Evan slayed it in his response letting Lou know there were people of many faiths part of his movement and then used hashtag #MormonMafia. As any good mafia would do this started a barrage of funny tweets using #MormonMafia. I particularly liked one where they were dumping out the Coca Cola before the authorities came. 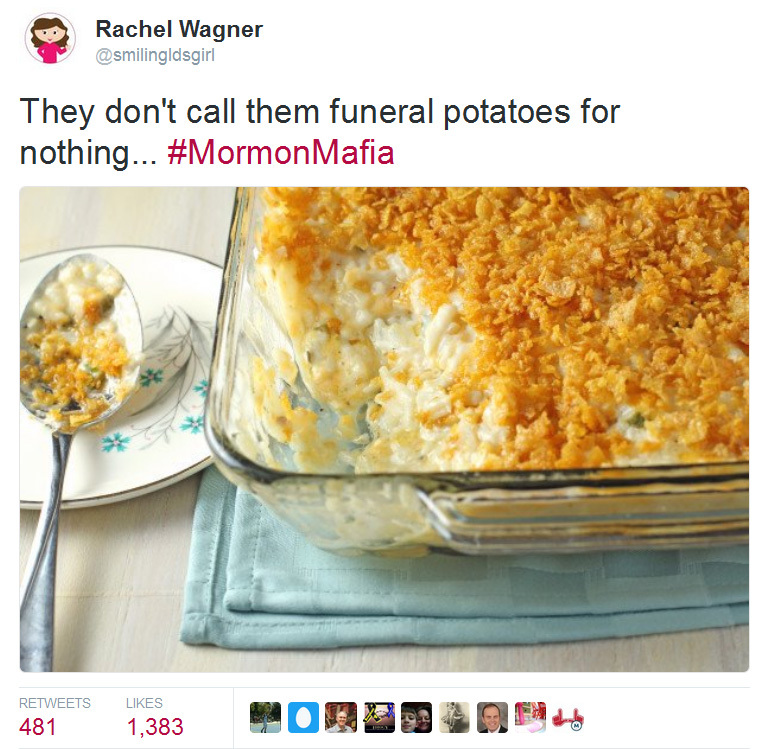 Well, I decided to join in the fun and tweeted out the above tweet “They don’t call them funeral potatoes for nothing” with a picture of the iconic Mormon side dish known as funeral potatoes. 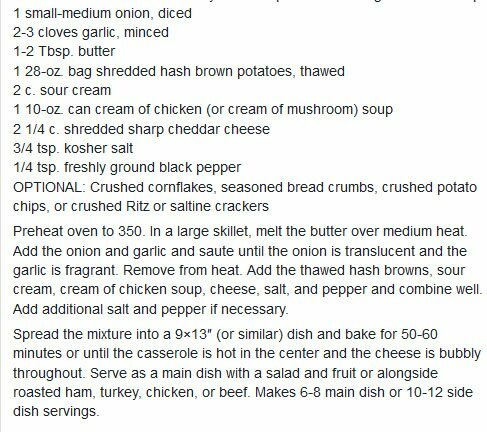 If you aren’t aware funeral potatoes are cheesy potatoes often made at funerals because they are comforting, easy and most people like them. Hence the name. Anyway, before I knew it my tweet had exploded like nothing I had ever experienced before. Last checked it had nearly 1400 likes and 481 retweets, which is a lot for me and it was quoted in all kinds of publications from Washington Post, LDS Living to the Huffington Post! The entire day I had friends and family letting me know they saw my tweet. Now I wish all of these people would subscribe to my channel but as they say any exposure is good exposure (most of the time at least). Nevertheless, it was a surreal and fun experience. You see friends, when you tell a joke someone finds really funny it feels good. If they are rolling on the ground laughing, it makes you feel kind of clever for coming up with said joke. That’s how I felt last week except for with thousands of people including all the social media platforms. In a way it was a little overwhelming but it also felt pretty good! It’s been a long depressing election cycle so I was grateful for a good laugh and the knowledge I’d made a few other people laugh if only for a moment. During this election we need those moments! Or at least I certainly need them. 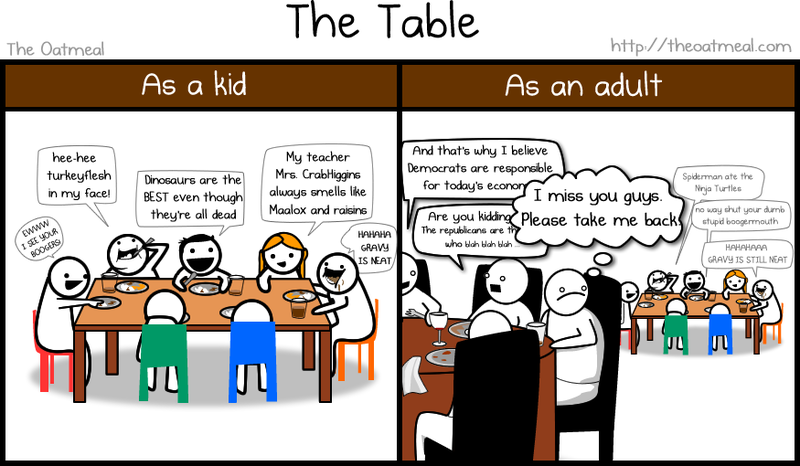 This whole thing has also given me a fierce craving for funeral potatoes! But watch out for that Mormon Mafia. You never know where they will hit first.